Can you inflate a balloon up without blowing it up with your mouth? We think that a balloon can be blown up without using your mouth. Stretch out the balloon by inflating it then deflating it. Attach the balloon to the bottom of the funnel. Take the 2nd funnel and put that on the mouth of the water bottle. 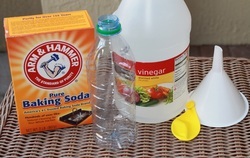 Then pour 1/2 cup of vinegar into the water bottle. Put the balloon on the mouth of the water bottle without pouring the baking soda into the bottle. Slightly tip the balloon over so the baking soda goes into the water bottle and hold the balloon up straight until all of the baking soda is in the bottle. Make sure the balloon covers the whole opening on the bottle. Do not shake the water bottle with the vinegar and baking soda inside. Do not remove the balloon after you pour the baking soda into the bottle. When you mix vinegar, an acid, with baking soda, a base it creates a chemical reaction and forms carbonic acid. When the bubbles are produced it breaks the carbonic acid down and forms a gas called carbon dioxide. The carbon dioxide inflates the balloon. Our hypothesis was correct and you can inflate a balloon with out air. Hi, I'm Ava. I love to play soccer, and basketball. I have two sisters and one brother. Hi, I'm Lindsay. I'm in 5th grade and I love to play soccer and I love to draw. I have two brothers named Kieran and Connor. and basketball. I have a sister named Fiona.